Is your child always begging for a pup? 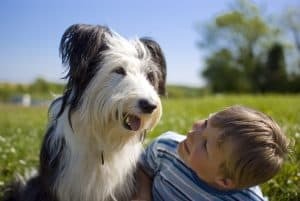 Here are five ways our kids can benefit from the companionship of a furry friend and become better human beings. This is a guest post from Jenny Perkins of Here Pup. Empathy and kindness are among the essential life skills that need to be instilled in children from a young age and play a crucial role in shaping their personalities as human beings and responsible citizens of the world. Our kids learn a great deal about life from the experiences they have and the examples we, as parents set for them. 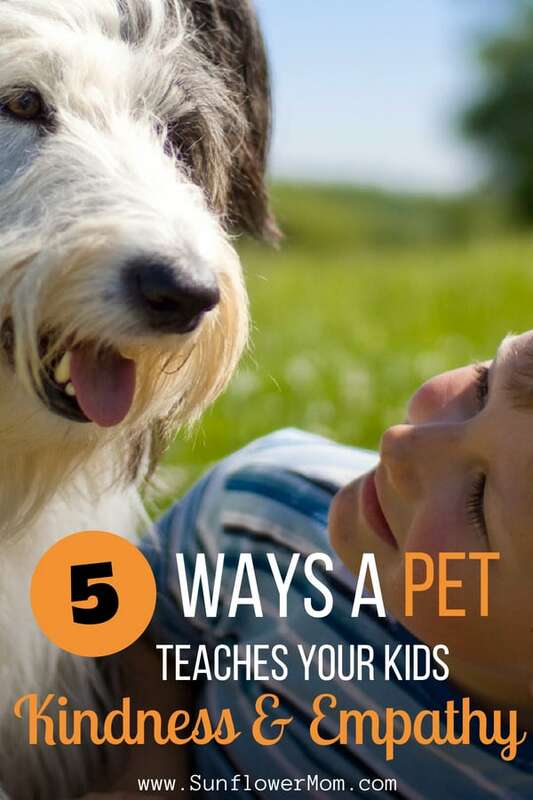 Since kids share a deep bond with pets, having a furry companion in the house can be an excellent way of teaching our kids empathy and kindness. Our children are the center of our attention, we fulfill their desires and make sure they stay happy; hence they end up becoming self-absorbed. Once a pet enters the picture, it draws our children’s attention away from themselves and teaches them to consider other’s preferences. It also enables them to understand non-verbal cues. When our dog barks or the cat yowls, the kids immediately run to see if they are okay or whether they need anything. The feeling of caring for another being and ensuring that its needs are met has made them much more responsible and self-efficacious. As I mentioned earlier, we as the parents are role models for our children. They learn by observing how we treat animals. The moment your child sees you properly feeding the dog, petting him and making sure he is well-cared for, they will understand the right way to treat other beings and learn to put the needs of others before themselves. Begin with the small things, teach your kids the correct way to greet animals, which won’t necessarily be the way your kids would prefer, but it is essential to show them the importance of considering the animal’s likes and dislikes more than their own. A 3-year-old won’t know that a kitten wouldn’t like being poked or squeezed, that is the kid’s way of showing affection to the animal. You as the parent need to teach your child that this isn’t correct and will hurt the kitten. He may be disappointed at first, but this is how eventually your child will learn empathy. Visiting the shelter can be a great way of teaching children how human activities can impact the lives of many animals. By witnessing hundreds of innocent animals under one roof looking for shelter and love, many of which are abandoned pets that have lost their homes, your kids will understand the need of kindness and love in this world. You can make it all the more beneficial for your children by making them contribute to the welfare of animals. Make them donate food and blankets to the sheltered animals, teach them the importance of standing up for animal rights, volunteer at the local shelter along with your kids and make sure all interactions with animals turn into an opportunity for learning. Once you adopt a pet, assign age-appropriate chores to your children and encourage them to take part in caring for the furry companion. It will be an opportunity for your children to learn responsible pet guardianship as a way to nurture kindness. Your kids will understand how important it is to keep the needs of others into consideration and how their actions can affect the lives of other living beings. Dogs can play a crucial role in improving social skills particularly for kids who are naturally shy or reserved. The stronger your child’s attachment with the dogs, the better the impact; research has proved this. This is because kids who are afraid of judgment and criticism can openly share and express their thoughts to their furry friends without the fear of being made fun of or laughed upon. It improves their self-esteem which shows up in their interactions with other kids and people around. So if you don’t yet have a pet and your kid is demanding to adopt one, it won’t be a bad idea to fulfill the demand. However, you do need to consider if you will be able to do justice to the animal’s needs as it will be a long-term commitment. However, once you have thought it through, visit the local shelter and adopt a furry companion that you think will suit your lifestyle.